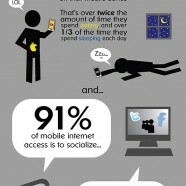 Mobile phones’s usage and the involved mobile is rapidly increasing. New technologies pop out offering new potentials in the way marketers reach and communicate with their audience. Microsoft Tag highlights some interesting mobile market facts.